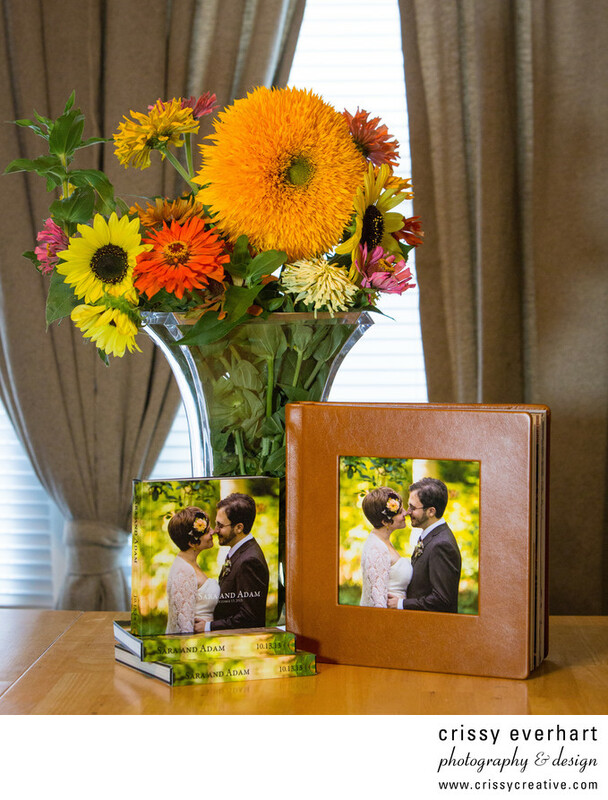 Every couple should have a wedding album that illustrates the story of their day. Not only does it feature the best images of you and your family and friends, but it is a timeless heirloom to pass down for generations. Yes, you can make your own albums online with the high-res images, but the quality from most of those DIY sites is inconsistent at best, and designing them is more of a process than you might imagine. The biggest problem, though, is that it tends to get put on the back burner, and then months and years go by, kids arrive and life happens, and you never get back to it. If you'd prefer a professionally designed, quality album that will last for years, then I can help! I offer several different album styles of varying prices and materials, so you can be sure to find something perfect for you, and even get gifts for parents and grandparents. All albums are available in either square or rectangular format. Wedding albums include 20 spreads (40 pages) so that's usually about 60-80 images. I lay out each two-page spread individually, retouch where needed, and send you a design to approve online. 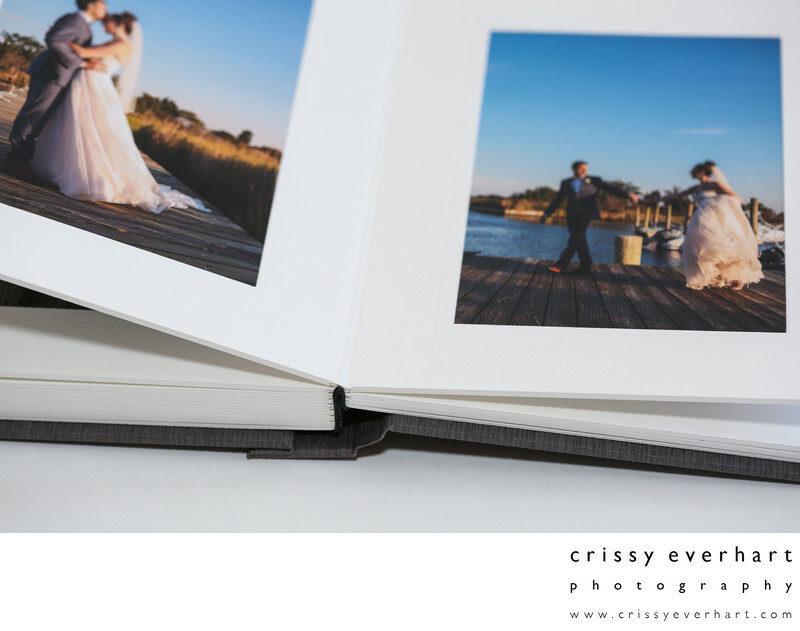 All albums are hand-made in the USA and I use only the finest vendors to ensure that the quality is top-notch and that you will be wowed by your wedding album for years to come. Portrait Albums are an excellent way to preserve a handful of images from your session in one spot. Several different portrait album styles are available, ranging from image folios of loose prints to panoramic photo albums. There are over 100 cover swatches and tons of customization options, it's easy to make sure every book is unique! This panorama digital flash album has thick, non-warping pages and is printed on top quality, archival photographic paper. With a huge assortment of unique leathers, silks, and fine fabrics, you can even add a metallic, glass, or funky cover to further set it apart from the rest (image cutout and 50+ leather options included, other cover upgrades available). These albums are truly works of art, and totally customizable. What's different: 50+ fine leathers at no upgrade charge, thicker pages, stronger spine. This contemporary and versatile album features lay flat pages and a non-leather cover with image cutout. Image wraps and photo panel covers available. 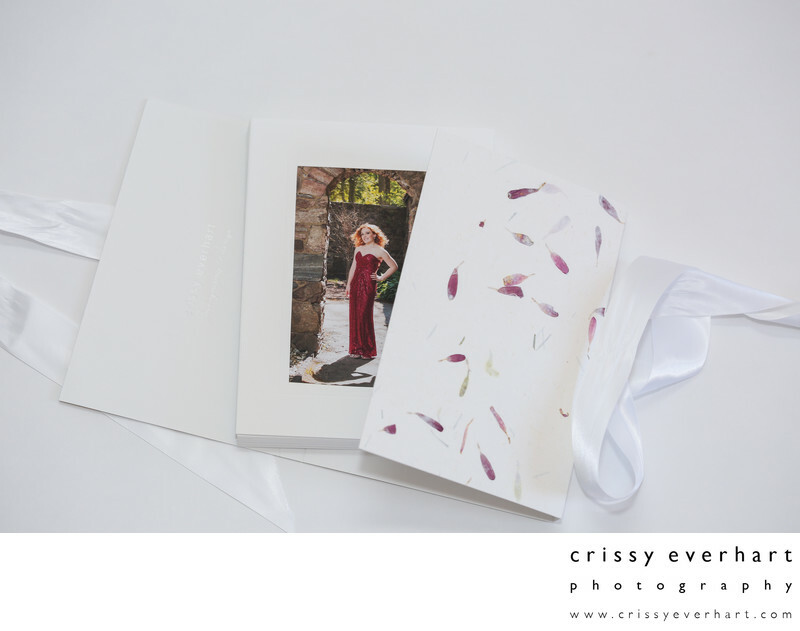 Your images are printed on photographic paper and mounted back-to-back so the pages are lightweight, which makes these albums perfect for parent albums and couples on a budget. The PhotoBook is available as a main album, parent album duplicate (exact copy of main album design) or an original design. These albums are also a beautiful way to show off portrait and engagement sessions! What's different: Non-leather options: vegan leather, fine fabrics, image wrap, or photo panel cover (shown, top right). Thinner pages, same photographic paper. When ordered at the same time as the ArtBook, you can get THREE or more PhotoBook minis (duplicates of your main album design in either 6x6 or 4x6) to give to parents, grandparents or whoever you choose. Image wrap or handmade paper cover. 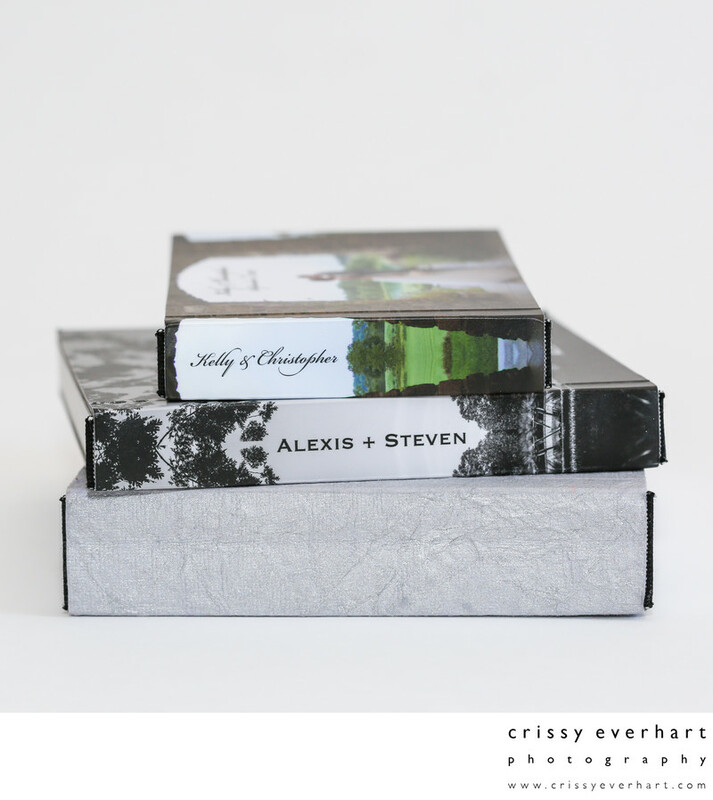 What's different: These are the same as the PhotoBooks only smaller and with a less substantial cover. Per the bindery, there is a minimum order of three minis at a time, and they MUST be exact duplicates of an ArtBook and ordered together. 10, 20, or 30 images matted one per page in a vertically bound album. Non-leather cover options and white or black mats. Photographic prints inside can be lustre or deep matte texture. Great for parent albums and portrait sessions! You can also leave the left side blank for signatures, and use these as guest books with your engagement session photos! What's different: These albums have photographic prints inside mats; no cover image. 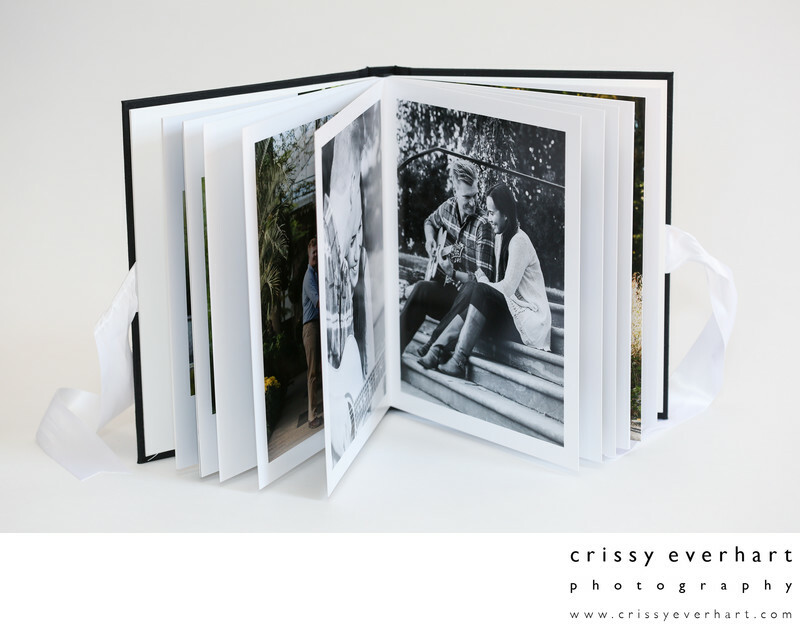 Your favorite 10-20 images matted and stored in a display folio with ribbon closure. Choice of light or dark: light folio has white mats with floral handmade paper (shown) and dark folio has black mats with charcoal paper cover. Great for engagement sessions, senior portraits, or family sessions! What's different: This is not an album- it is a collection of loose, matted prints - each image is printed as a 4x6 and matted to 6x8 mats. Choice of lustre or deep matte photographic paper.